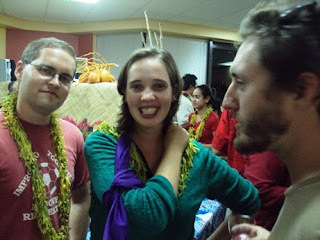 The United States Chargés d’Affairs invited Americans to the embassy last night for a Survivor premiere party. Survivor Samoa premiered in The States last week, but it probably won’t show on either of the TV stations here for a while. And though we won’t be able to watch the rest of the season, who’s not down for a castaway-themed party? So the Apia volunteers met up and headed over. I thought the castaway theme was funny. The Peace Corps lifestyle is rough on clothing, and my joke was that since castaway costumes were optional, I could either wear something from my closet or I could wear something from my closet. Another volunteer had holes in the shorts and t-shirt he wore today, and leaving his house he looked down and thought people might think he’d showed up in costume. I haven’t been to the embassy since the election last November, and a visit there is always a regal experience. There are all kinds of posters and pictures on the walls touting the greatness of America. The bathroom is fancy. There are cubicle walls and cable TV. All of these things that seemed so menial are now posh. The food was great. In addition to the Chex Mix, which was fantastic, there were deep-fried mussels and breaded fish and samosas and tropical fruit. And then it was time for the main event. I watched the first 2 seasons of Survivor, and I remember how much of a media event the final episode of Season 1 was in which Richard and Kelly went head-to-head in the final Tribal Council. “On this island there are snakes and there are rats,” was a moment to remember. 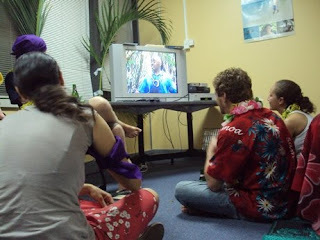 But none of that compares to watching Survivor Samoa in Samoa with a bunch of Samoans. Last night was surreal. News of Jeff Probst’s recent Emmy win had spread, and expectations were high. I imagine if the season aired after I return to The States, I would be nit picky about things and it would annoy everybody else because no one would care about the minutia of my complaints. But watching here with a room full of people who collectively cringed at Jeff Probst’s butchering of the Samoan language was satisfying. As far as the actual contestants go, I have 2 thoughts. First, America should not export reality television. It flies in the face of the rosy portrait of respect we strive for. On the other hand, my second thought is there are ridiculous parallels between the show’s premise and the Peace Corps experience. In their first moments on the island they look haggard and appear to be in shock. They immediately establish an internal pecking order. Alliances are formed and broken and formed again. And someone gets a million dollars at the end. Finally, the best part of the show might be the middle-aged mulleted female ex-marine who calls herself “Shambo”. We could certainly use a Shambo within our ranks. Come on, group 82. The crowd watching the TV. These people are American tourists who just happened to be in town. 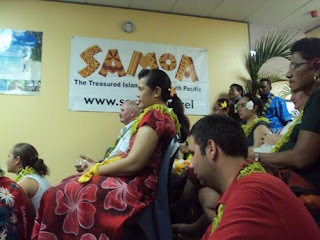 I downloaded this episode just so I can watch the glimpses of Samoa. I was annoyed too no one corrected Jeff's prounciation of the tribal names during preproduction...now I have to listen to him do it all season. It's like when Samoan names started popping up on TV for NFL and Rugby, at first they butchered it, but it got better. Anyways Im in for the venomous Oil Billionaire from Texas..he's my kinda crazy. I downloaded Survivor Samoa aswell since it's not showing yet here in Australia and I have to agree "SHAMBO" is the bomb. And yes, it's good to see you picked up on Jeff Probst's butchering of the Samoan language and I fear it's just going to get worse. I wish they would have highlighted more of Samoa's scenery but eh it's only the first episode I guess. 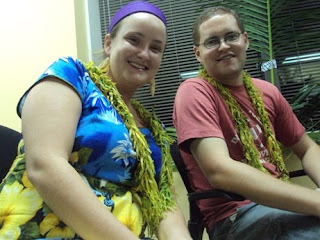 Pronouncing of 'aiga' was so baddddddd, even my children recognizes it and they don't speak Samoan.